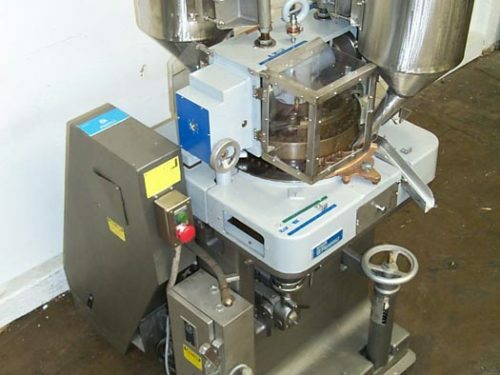 Manesty Model Beta Press, 6 station rotary tablet single sided tooling unit rated from 50 to 250 tablets per minute – depending on product, and size and depth of tablet. Maximum operating pressure of 6.5 tons and maximum pre compression of 3/4 ton. 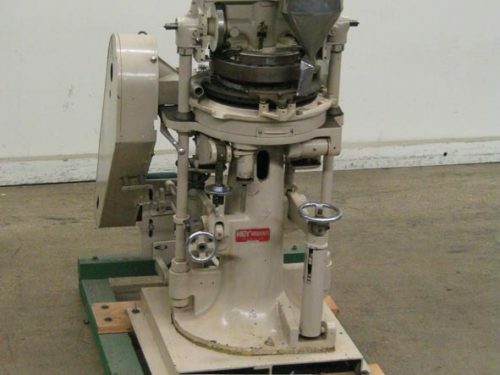 Equipped with 10" diameter x 16" long stainless steel product feed hopper, with product force feeder, keyed 3/4" OD upper and 1" OD lower dies, push button start / stop controls, ton pressure gauge and tablet counter with flip open safety guarding. Mounted on forkable pedestal style base.